Domine, Quo Vadis? | The journey of a man striving for holiness. Rediscovering the centrality of God’s word in the life of the Church also means rediscovering a sense of recollection and inner repose. The great patristic tradition teaches us that the mysteries of Christ all involve silence. Only in silence can the word of God find a home in us, as it did in Mary, woman of the word and, inseparably, woman of silence. This principle — that without silence one does not hear, does not listen, does not receive a word — applies especially to personal prayer as well as to our liturgies: to facilitate authentic listening, they must also be rich in moments of silence and of non-verbal reception. –Pope Benedict XVI. Tomorrow, my brothers in the Spirituality Year at St. John Vianney join those from St. Charles Borromeo Seminary in Broomtree, SD for the Spiritual Exercises of St. Ignatian of Loyola, a 30-day silent retreat that aims at disconnecting you from the things of the world so that you may better hear the Lord. Just as our bodies need exercise to stay healthy and fit, so too do our souls. During this retreat, we will be praying 5 hours a day, not including Mass. We meet with our spiritual directors daily to discuss the graces we have experienced and to evaluate our spiritual fitness. And then we pray. And pray more. To me, this is like The Biggest Loser, except for our spiritual side. It will likely be the most intense 30 days I’ve experienced in my whole life. The Lord will push me to the limits of what I see as “doable.” But, in return, the Lord is providing me an experience of a life time. Very few priests, let alone laymen, will ever get to experience the Spiritual Exercises. Those that do frequently remember back to the experiences and graces they received over their 30 day. As intimidating, difficult, and “unfun” as it seems to many, I have never heard of someone describe their 30-day as a bad experience. I am excited for what the Lord has in His providence over the next 30 days. It is also extremely out of my comfort zone (which is honestly probably where the Lord wants me). Please keep me and my brothers in your prayers. We will return to Denver on June 15th. I will be back in Oklahoma on June 21st. It’s hard to believe that my first year of seminary is wrapping up. But here it is, May. The Spirituality Year will be over in a matter of days, and the culmination of what the Spirituality Year prepares men for is upon us. On May 16, my 21 SY Brothers and I will travel to Broomtree Retreat Center in Irene, SD to embark on the Spiritual Exercises of St. Ignatius of Loyola, a 30-day Silent Retreat that revolves around Ignatian contemplation and silence. If I were to tell you that the year was not full of difficulties, I would be lying. Similarly, though, if I were to tel you that this year was horrible, I’d be lying even more. Even with the burdens that this year has carried, like the Media and Commerce Fasts, it had been the best of year of my life. I wish that every Christian man would be able to participate in this year. The graces that the Lord has poured out upon me have been incredible. There is honestly no way that I could describe all the things that the Lord has revealed to me this year. So, I’m only going to describe a few experiences. 1). It’s the Lord who does all the work. Part of the Spirituality Year consists of a 30-day Immersion with the Poor. I worked with homeless and near-homeless people doing what is known as friendship evangelization. Often, this consisted in taking our “friends” to get food, go shopping, get healthcare, find jobs or housing, and so forth. We also had an apostolate, or pastoral assignment. My apostolate was at St. Vincent de Paul Catholic School here in Denver. Every week, we would go to our apostolate and hang out with the kids. I was assigned to Mrs. Mary Donelson’s Third Grade Class. We would be in our respective classrooms for an hour then go help out in Extended Care for an hour and a half or so. Anyway, back to the grace. I felt like I did very little at my apostolate. Sure, I had fun and the kids did too, but did I really have an impact? The answer is YES! How? It is the Lord who does the work through you! If you open yourselves up to God and his Divine Will, you allow God to work through you. By just being me, the Lord worked through me. It is unbelievably hard to even think of this being possible until you see it. This grace has also been awesome for me to contemplate over the past several months. In short, if the Lord is doing the work through me, then I really cannot take “credit” for the work. I can thank God for working through me and for the things he has done to others, but I cannot say “Look at all the great things I’VE done.” As a priest, he cannot praise himself for many of the things that he does. It’s only through the Lord that it happens. 2). The Lord loves you more than you can imagine, no matter what you may have done in the past. It’s Satan who will try to degrade you. In addition to the upcoming 30-day silent retreat, we did a 3-day in the Fall and a 5-day in March. In one of my meditations, the Lord revealed to me Satan’s tactics. Satan, often times, is made out to be powerful, valiant, and cunning. However, this really isn’t the case. Sure, he can be cunning. But most of the time, his tactics are extremely sad and even comical. Satan will attack you where you are weakest. He will attack you in your past, saying how horrible or sinful of a person you are. He will rub salt in the wounds of your past, making you question your worthiness. But the truth is, Satan is pitiful. He has NO control over you once you turn your life to the Lord. He will try to attack you where you are weak because where you are strong, he would be struck down swiftly. Once you realize that Satan is weak and has no control over you, the quicker you can be free of anxiety and doubt and grow to recognize God’s love even more. 3). I’m where the Lord is calling me to be. I ask for your prayers for my brothers and I as we prepare to head off to do our 30-day Silent Retreat. Following the 30-day, I have been assigned to spend the summer at St. Eugene Catholic Church in Oklahoma City. I will be there for several weeks before preparing to head back to Denver on August 20th. My posts will probably be more frequent following the 30-day Spiritual Exercises (we were asked not to blog during the year). I was blessed to attend Fr. 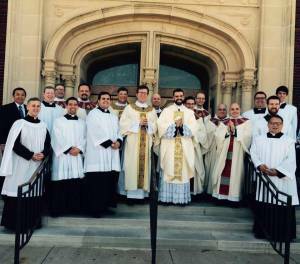 Aaron Foshee’s Mass of Thanksgiving this past Sunday. Fr. 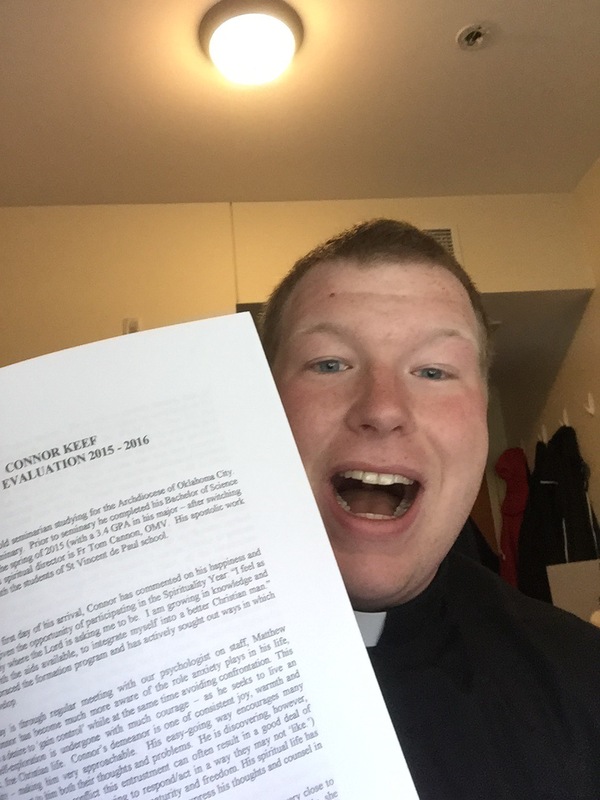 Mike Keucher of the Archdiocese of Indianapolis managed to post Fr. Jim Goins’s (my pastor) homily! Tonight, Catholics across the world celebrate the end of Lent and begin the Sacred Paschal Triduum leading up to the Mass of the Resurrection. The Triduum, as it often shortened to, is a very special time in the Church, full of signs, symbols, and traditions of our Church. For example, Good Friday is the ONLY day of the year where Mass is not celebrated, representing the absence of Jesus from the world at his death. On the Easter Vigil, the Church welcomes those who are entering our Church with Baptism, Confirmation, and the Holy Eucharist. 2 My God, my God, why have you forsaken me? so far from my words of anguish? I call by night and I find no reprieve. entrusted me to my mother’s breast. trouble is near, and there is no one to help. like a lion, rending and roaring. a band of the wicked besets me. 18 I can count every one of my bones. They stare at me and gloat. my poor soul from the horns of wild bulls. revere him, all you descendants of Israel. nor scorned the poverty of the poor. 26 You are my praise in the great assembly. 27 The poor shall eat and shall have their fill. They shall praise the LORD, those who seek him. May their hearts live on forever and ever! 29 for the kingdom is the LORD’s, he is ruler of the nations. before him shall bow all who go down to the dust. 31 And my soul shall live for him, my descendants serve him. The Triduum is so rich in spiritual gifts. I highly recommend, whether you are Catholic or non-Catholic, to be filled with the joy and mourning of Christ and check out the Triduum. Spring Break has come and gone, almost too fast. It was a much needed break from school, even though it was not as long-lasting as I had thought and hoped for. Today, I got to do something that I had never done before: altar serve a Mass in the Extraordinary Form. Yesterday was the Feast of St. Joseph, my patron saint. I attended St. Joseph’s Church in Krebs for Holy Mass. When verifying the time for Thursday’s Mass, I discovered that the pastor, Fr. Kevin Willis, would be saying a Mass in the Extraordinary Form on Friday. For this, I got super excited. I very rarely get to go to the Latin Mass, much less two miles from home. After Mass on Thursday, while talking to Fr. Kevin, I mentioned “I would ask if you need help serving, but I have no clue how to do it.” Father proceeded to walk me through it. That alone was a treat. I have served more masses than I could even attempt to count. All of these, until today, had been in the Ordinary Form. The Extraordinary Form is a whole ‘nother animal. Not only are there more things for altar servers to do in the EF, you’re making the responses for the people in another language. Every move you make must be calculated as everything you do is a symbol or representation. It’s very easy to become numb to the importance of serving at Mass in the Ordinary Form. Let’s just say that I won’t be numb to it anymore. 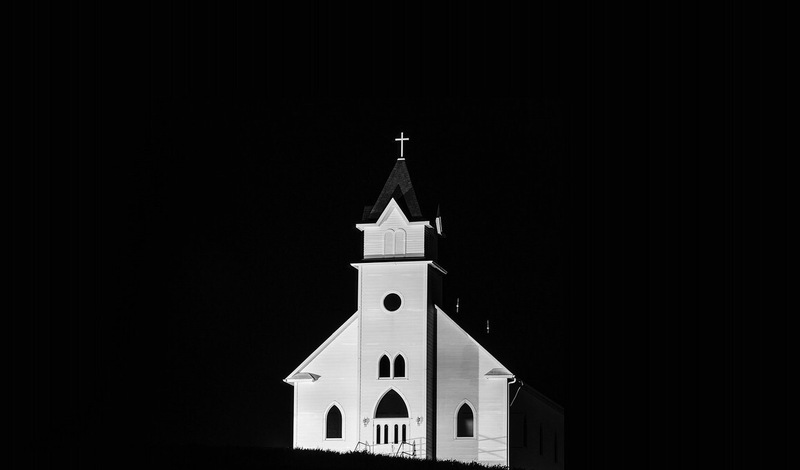 There was recently an article published by Patheos that reinforces why you shouldn’t be numb to serving. Reason #7 is “You are the Angels before the Throne.” The Extraordinary Form made this very evident today. 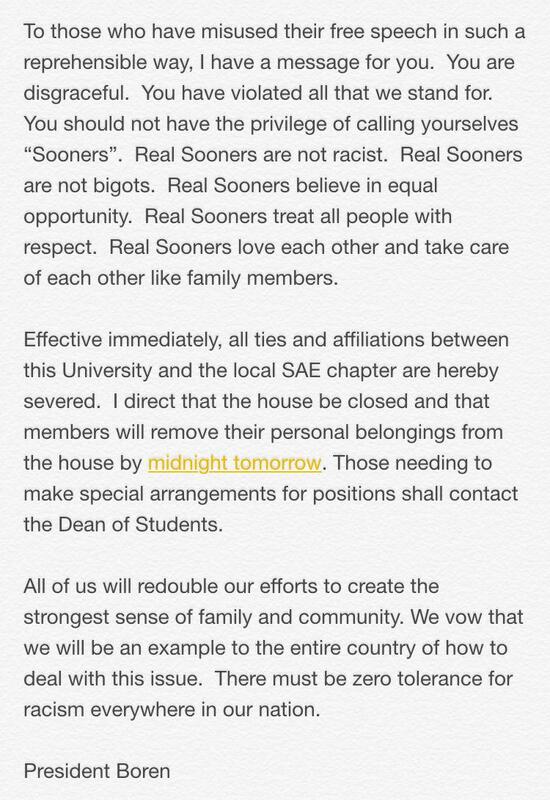 Late yesterday, news broke about members of SAE at my alma mater, the University of Oklahoma, chanting racist things. Honestly, I initially thought that people were overreacting, as we often do. Then I saw the video (I won’t post that video on my page. I’m sure you can find it very easily if you really want to, which you shouldn’t.). It wasn’t a single member saying a single racist word; it was a whole bus full of members chanting a racist song, a song which was definitely taught, whether that be officially or unofficially (that is, I believe, still under investigation). The song, quite frankly, is disturbing on so, so many levels. I am ashamed that this would happen at OU and that all of OU is shaded in controversy for what a small group of people have done. Luckily, the University’s quick response has softened the blow from SAE’s actions. In fact, the White House has applauded President Boren’s actions. One thing we must remember is this: as outrageous as what SAE members said is, we must make sure to remember that people make mistakes. We should condemn the action, but not the person. It is not wrong to express outrage, but we should stop short of judging the people. This isn’t to say they shouldn’t be punished: there has already been some punishment and there is sure to be even more coming down the pike. If nothing else, this has united the University and exposed a problem in our culture. Through prayer, hopefully this will be resolved. Wednesday was my first full day in our Nation’s Capital. Overall, it was a great day. DC is such a cool city. I had so many misconceptions about it (like it bring crime-ridden). Its been a great experience so far. It is the birthday of Saint Agnes, who is said to have suffered martyrdom at the age of twelve. The cruelty that did not spare her youth shows all the more clearly the power of faith in finding one so young to bear it witness. A new kind of martyrdom! Too young to be punished, yet old enough for a martyr’s crown; unfitted for the contest, yet effortless in victory, she shows herself a master in valor despite the handicap of youth. As a bride she would not be hastening to join her husband with the same joy she shows as a virgin on her way to punishment, crowned not with flowers but with holiness of life, adorned not with braided hair but with Christ himself. This was a perfect thing to reflect upon the day prior to the March for Life. Just as St. Agnes, was innocent, so are the victims of abortions. We must work to protect the innocents of our time. Much of this will be exemplified tomorrow, when hundreds of thousands descend upon Washington, DC to March for Life. Very fitting, the US House of Representatives will be voting on H.R. 36, the Pain-Capable Unborn Child Protection Act. Pray for the marchers, legislators and politicians, and the unborn!